POWERFUL RECHARGEABLE Lithium Ion Battery delivers up to 6 hours of playtime without having to stress about charging. MULTIFUCTION BUTTON allows you to start/stop music, take calls with the built in microphone, and change the volume all in one location! FLEXIBLE WIRE designed to shape to your ear will not fall off even when running or with other activities. BLUETOOTH 4.0 delivers up to 33 feet of range. Never worry again about losing your signal! 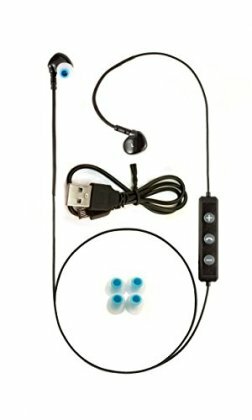 Includes Micro USB charging cable, 3 sizes of earbuds for maximum customization, instruction booklet all within a 100% recyclable package.